Kevin Howe’s article Monterey Herald, dated March 1, 2007, discusses the water regionalization program for the Central Coast of California. In his article, Howe states, “If Monterey Bay water officials are looking for alternatives for ensuring regional water supply; they might start by deciding just what the ‘region’ is. Water “regionalization” might sound benign, but the consequences that come as a result of political regionalism must be understood by freedom loving people or liberty will be trampled. Regionalization is the program being used to destroy traditional political boundaries and usher in a transformed system of governance that abolishes private property. This new political system is called “Sustainable Development”. One thing is for certain; “regional” political systems are not consistent with the democratic Republic designed by this nation’s forefathers and defended by this nation’s earlier generations. As “change agents” advance the “Regional” water bureaucracy authority, we, the citizens, lose our check and balance on the executive branch of government. Rural landowners also lose their property right in water. Equity completes the conversion of our system of justice from equal justice to “social” justice. This surrenders the essence of the meaning of the American experience. Economy means the conversion of the American system of free enterprise into the emerged global economic system of “public/private partnership.” This system of economics is designed to abolish private property. Environment is the political movement that values human beings as equal to or below the importance of nature’s elements including: animals, plants and rocks, thus, attempting to “morally” justify planned and “spontaneous” human population reductions. In this regionalization process, control of water on rural lands will transfer from landowners to multi-national corporate and/or government control agents. This enables globalist neo-conservative “water-masters” to begin their work in achieving centralized World Bank objectives which include severe limits on individual water use. Many American rural areas are being ‘cleansed’ of people during regionalization processes. Regionalization is a core aspect of Sustainable Development. To meet Sustainability objectives, the human population needs to be reduced – perhaps you or people you love will be contributed to the ’cause’ of saving the earth from excessive numbers of human beings. A wise woman, Charlotte Iserbyt, a former high ranking federal education department official wrote, simply, how and why: “Regionalism is Communism“. Regionalism is also the political method of advancing economic Fascism. 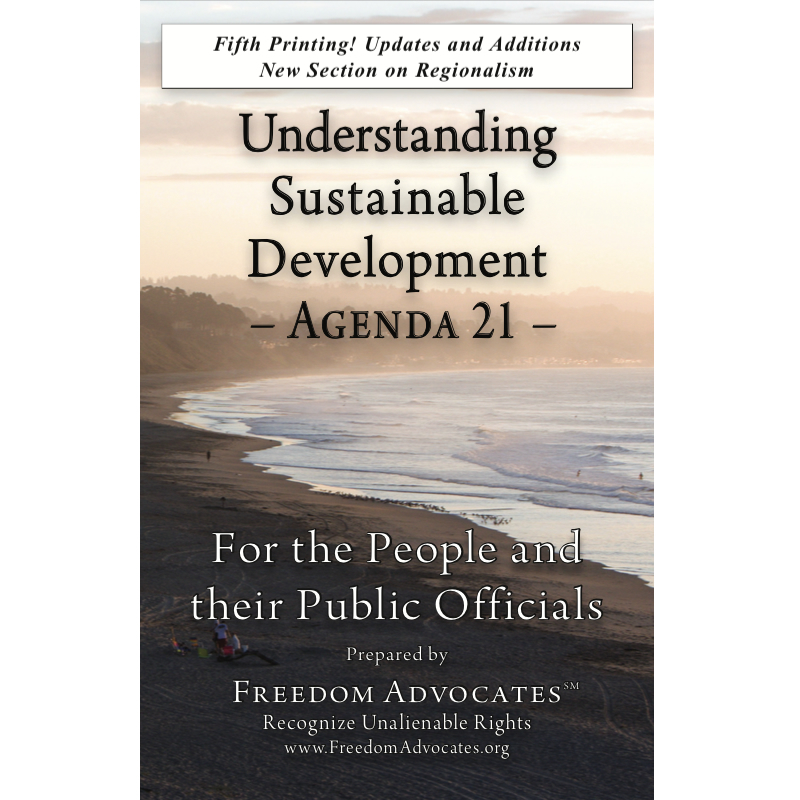 Sustainable Development is the infrastructure and indoctrination program for transforming America from a democratic Republic, free person society, into a member of the fascist-communist order. If Monterey Bay water officials are looking for alternatives to ensuring a regional water supply, they might start by deciding just what the “region” is. Proposals fielded Wednesday at a Monterey Regional Water Supply Collaboration meeting, called by the state Public Utilities Commission’s Division of Ratepayer Advocates, ranged from including all of Monterey County to tying Salinas and southern Santa Cruz County to a regional system. The meeting was held in Marina. Self-described “facilitator/autocrat” Steve Kasower of the University of California-Santa Cruz urban and regional water research team, who chaired the meeting, said all interested communities are free to attend the sessions. While the water collaborators are “not a water management group,” he said, “we’re not just a touchy-feely group.” Since the meetings have been called by the PUC and its ratepayer advocate division, “it has teeth, and can bite you.” Kasower is serving as a consultant to the Division of Ratepayer Advocates, which has called the series of meetings to determine which water agencies would be on board for a regional approach. The event has drawn dozens of representatives from area water agencies, private companies and citizen organizations. North County’s Pajaro Sunny Mesa Community Services District has not sent representatives to the meetings. A report on future water demands outside California American Water’s Monterey service area listed North County, including Moss Landing and Castroville, but not Salinas or Watsonville. Curtis Weeks, general manager of the county Water Management Agency, said demands outside Cal Am’s service area should be addressed. The report shows a current water demand in North County of 4,970 acre-feet and a potential future demand for 11,400 acre-feet per year. Determining which “region” should be served should “focus on where the people are,” said George Riley of Citizens for Public Water, who contended that “85 percent of Monterey County lives within 15 miles of Ryan Ranch” business park in Monterey. “But the majority of the water is in South County,” responded Madeleine Clark, president of the Elkhorn Slough Coalition. Riley also took issue with the water demand figures submitted to the group, saying different agencies have different management patterns and demands. The group, he said, should adopt a standardized approach to quantifying water management. David Pendergrass, chairman of the Monterey Peninsula Water Management District, and Howard Gustafson of the Marina Coast Water District said the group shouldn’t get bogged down arguing about the numbers. Future demand projections are based on “very detailed information,” said David Berger, general manager of the Peninsula Water District. Marc Lucca, general manager of Marina Coast Water District, said differences in climate and water usage drive differences in demand between areas. Cal Am and Pajaro Sunny Mesa have proposed building pilot seawater desalination plants, followed by regional-size plants. Sand City and Marina have small desalination plants, and the Monterey Regional Water Pollution Control Agency provides recycled water for agricultural areas. Seawater desalination is being studied as a water supply alternative by the Peninsula Water District. The candidates include land-based plants based in the Moss Landing area of ocean-going desalination ships proposed by Water Standard Co., which holds patents for turning seawater into fresh water, and PBS&J Engineering, a company specializing in program management, process design and construction supervision of large water purification and wastewater facilities. A seagoing water desalination plant would solve environmental problems posed by land-based plants over intake of seawater and discharge of brine, said Charles “Skip” Griffin, senior vice president for PBS&J. Using seawater from once-through power plant cooling systems, such as that at Moss Landing, as a desalination intake source is a technology that’s “dead in the water,” Clark said, since a three-judge panel of the Second Circuit U.S. Court of Appeals ruled Jan. 25 that the U.S. Environmental Protection Agency can’t allow power plants to kill fish through their cooling seawater intakes. Steve Leonard, vice president and Monterey service area manager of Cal Am, said the water company must move forward to comply with an order by the state to cease overpumping the Carmel River aquifer. “We need agreement on how big the (demand) numbers are and what the region ought to be,” he said, or else “it’s a nonstarter to build a desal plant.” As for standardizing water demand statistics, Leonard said, “we should talk about policy issues, and the little numbers will take care of themselves. “Our projects are policy based,” he said: comply with the state Water Resources Board, replenish the aquifers and meet water needs. In 1995, the state Water Resources Control Board advised Cal Am that it was taking an extra 10,730 acre-feet per year from the Carmel River aquifer — more than was legally allowed. The river is the major source of water for Cal Am customers on the Monterey Peninsula as well as the Monterey Peninsula Airport District, Pebble Beach and other unincorporated areas of the county. The water resources board ordered Cal Am to develop another source for water it takes beyond the 3,376 acre-feet per year from the river aquifer, and until then, to reduce annual pumping by 20 percent. In 1998, the state Legislature required the Public Utilities Commission to develop a long-term water supply contingency plan to meet the needs of Peninsula residents. Defining the water alternative supply “region” will be included on the water supply collaboration group’s agenda when it next meets March 28.